Women’s Day in Laos: Our interview with four female deminers who have put their lives at risk to keep others safe! All deminers, whether male or female, must work as a team to manage difficult tasks that no single individual could perform. Good morning. My name is Davine. I come from Ban Houayho village. I am 19 years old. I have four brothers and sisters. I am the oldest. Is your village situated on the mountain or on the plateau? We live on the plateau. What is the main occupation of the people in your village? We do upland crop farming and coffee farming. Not very people do paddy rice farming. What made you want to come to work as a deminer? I want to gain more experience. Early on, when I was a student, I didn’t do very well in school. I dropped out of school to assist my parents with a charcoal-making project. When the naiban of our village announced [that a UXO clearance company was looking for workers] I decided to apply. When I asked my parents they agreed. They said if you want to apply, go ahead. That’s when I joined Phoenix Clearance Ltd. (PCL). When you applied, did you think the work would be hard? I told them, “At the beginning I was afraid, but after Mr. Vilasak trained me, I’m no longer afraid. I feel confident now. So, a woman can do the work? Davine: Yes. Women and men can both do the work. But…perhaps…men can do better. What do you prefer, “area clearance” or “response team”? Aren’t you afraid of a bomb accidentally exploding? No, I’m not afraid. In the beginning I was a little afraid, but not any longer. Not any more. I like to hear the blast! You like listening to the bang? We noticed that when you were assigned to work as a sentry and were supposed to use the megaphone to warn people about the demolition, you looked shy. Were you embarrassed to do that? At the beginning, since I never before in my life had used a megaphone, I was a bit nervous. Now, it’s no problem. I can also use the radio. I have no problem now. Do you call home, now and then? Who do you call the most? What did your mother and father tell you when you left home to start work as a deminer? They told me to look after myself. Don’t work hastily. Take it slowly. Try to get along with your teammates. Don’t get clumsy. That’s about working around UXO. Did they give you any advice about life? They also told me, don’t have too many boyfriends. Don’t drink too much because you have work to do. What do you do with the pay that you earned as a deminer? I give it to my mother. What will you buy with your savings? I’d like to buy a motorbike. As a deminer, aren’t you afraid of an accident with UXO? At the beginning I was afraid but after I went to UXO training and I had the experience of working in the field, I lost my fear. But, at the beginning I was afraid. I feel comfortable of handling the job now. Does your village have any history of accidents with UXO? Anyone lost a life, or an arm, or a leg? 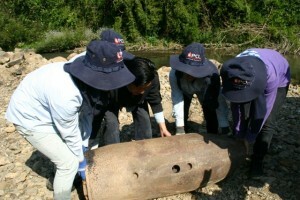 How do you feel about the need to clear UXO from your country? I deeply, from my heart, wish to see PCL destroy UXO. Here, [where we are no working] and in my village, Ban Houayho, if that’s possible. How do you think UXO has affected the lives of Lao people? In my village there isn’t too much ordnance so we are not that afraid when we work in the fields. We’re only afraid when we happen upon it. If we don’t see it, we aren’t afraid. When working with a response team you sometimes have to lift big bombs [weighing 300 pounds or more]. Does the work wear you down? No, because in my village I worked harder than this! I worked on our farm and I think that was harder than the work we do as a deminer. I think our work here is much lighter. Could you see yourself doing this work for the rest of your life? Or, do you just want to save some money and then look for different work to do? I think, if its possible, I’d like to continue to work as a deminer, until the end. I don’t care where [in Laos] they have me work. How many Americans have you met? None. We’ll none except Mr. Jim. Since I was born I haven’t been out of my village much. I just stay close to home. Since I was young I worked on the farm or worked in the house. When the village had a special event I was not allowed to go out and play. How far from your village have you ever travelled? Only within my district. This is my first time out. I’ve never even been to Pakse! Never been there. However, I’ve been to Paksong. Most of my time was spent in my home. How long were you on the bus from your village to here in Phongsali? Three nights and four days! If, as deminer, you visit a school to talk about safety, what would you tell students? I would tell students that UXO is dangerous and nobody should touch or tamper with ordnance. Because UXO can kill. I’d tell them, “If you see it, leave it alone; don’t touch it. Tell an adult and take them to see it. Or, make a sign at the location and ask the UXO response team to deal with it. We’ve noticed that whenever you see babies in the village you are very happy. [Laughs] Yes, because I miss my brothers and sisters. When I see children I think of them. I miss them. Someday, when you are married, how many children do you want to have? [Laughs] Three will be enough! Kik: My parents told me that when you are working focus on your job; don’t play too much. Concentrate on your work. Omphon: They told me that when I am far from home I should behave and not go out drinking. I should listen to my boss. On de-mining being a “man’s job”. Kik: [Emphatically] A woman can do the work also! Omphon: In the beginning I knew it was men’s work, but after training I now believe women can do it. I feel confident working with UXO. Because I worked on our farm, I can carry heavy loads. Nuey: Although many think it’s a man’s job, women can do the work also. In the beginning I was afraid of UXO. I thought I couldn’t do the job. As time went by I got more confident and I’m no longer afraid. At first I thought it was hard work but once I got into it I found that it wasn’t all that hard. I can do it. I know that its men’s work, but I like it. On what she will do with her pay. Kik: I will send all my money to my parents. It’s up to them, what they want to buy. If my mother wants to build a new house, then I will send the money. Omphon: I give my pay to my parents. They bought a streamer [weed cutter]. They also bought rice because they are poor. Nuey: I will give it to my mother and my younger sister. I don’t know what my mother will do with the money. Probably buy food. I want my younger sister to go to school. Kik: I call my mother every day. I miss her every day. I call my brothers and sisters when I miss them. Nuey: Mostly, I miss my mother. I call her. I tell her not to worry about me. I’m fine here, working with the UXO team. I’m just worried that she will worry about me, since I’m so far away from home.